Whenever Salman Khan and Kabir Khan come together (Ek Tha Tiger, Bajrangi Bhaijaan) they have a history of giving the 2nd highest grosser of all time. So if their third film together, Tubelight, becomes the 2nd highest Bollywood grosser of all time (behind Dangal) it will be considered a gargantuan success. But this time the story is a lot more mellow, Salman plays a normal character without any fighting involved, the music hasn’t become a huge hit, and the promos haven’t been unanimously praised. But Salman Khan can sell movies on his own and make them enjoyable through his sheer presence. Will his Eid magic continue this time too? Story: Laxman Bisht (Salman) is a slow person who doesn’t grasp everything quickly. That’s why he is called a ‘tubelight’ by his school friends and townsfolk. His brother Bharat (Sohail) and Uncle Banni Chacha (Om Puri) take care of him. But the 1962 Sino-India war is on the anvil, and Bharat enlists with the army. Laxman is taken apart from his brother and starts hating the Chinese. Things turn around when a Chinese-Indian single mother (Zhu Zhu) and her son Guo (Matin Rey Tangu) come to live in the town and Bharat gets close to Guo. Through a series of events, Bharat learns to respect people not based on their religion or race. But he also has faith that his brother Bharat will eventually return. So he sets out on a mission to make that happen. What happens eventually? Watch the movie to find out. Screenplay and Direction: Kabir Khan brought about emotions organically in Bajrangi Bhaijaan. The emotions brought about tears naturally but this is where he goes wrong in Tubelight. 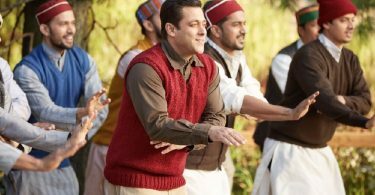 The drama is upped an ante in Tubelight and the scale is also higher, but this is what goes against the film as the emotions feel manipulated and the audience almost feels compelled to shed a tear or two. That is not to say, Tubelight is a bad film. It is far from a bad film but the expectations with Tubelight were a lot higher than they were with Bajrangi Bhaijaan (which seemed to come out of nowhere), and it disappoints to that degree. But the bond between the two brothers, the bond between an innocent Indian guy with a Chinese-Indian kid, the commentary on racial tensions, the subtle commentary on Hindi-Chini bhaichara are things which have been brought up beautifully by Kabir Khan. Not a lot of big budget Bollywood tentpole films want to explore the geopolitical relationship between India and China. So Kudos to the team where it is due. And Tubelight is entertaining as a movie too. That helps. Tubelight has been mounted on a grand scale with well choreographed war sequences, and plenty of world building involved. The production design and costume design suits the nature of the film to the tee. Attention has been paid to details. The war choreography is decently put together but more could have been done to make it seem brutal. The background score is decent and doesn’t impede the proceedings of the film. The music of Tubelight works better within the film than in standalone avatars. Radio is a earworm. Naach Meri Jaan grows in the film, Tinka Tinka is too mellow dramatic. Acting: Salman Khan, as is the case with all of his movies, is the centrepiece of Tubelight. He could have easily made another action film and made money but being at the top of his game he still decided to go in an unique road playing this character and for that he needs to be lauded. And he has definitely improved as an actor showing more range in Tubelight than he has in any of his films in the last decade. But he doesn’t quite pull it off as you’d want a supreme superstar like him to. His expressions and behaviour is on point technically, though. He is decent in Tubelight but the role had potential to become a classic character. Sohail Khan doesn’t have a lot to do but he looks the part and he’s decent in his role. Matin Rey Tangu is adorable and he pulls off the scenes quite convincingly. Zhu Zhu is beautiful. And she’s darn good at channeling her emotions. The Late Om Puri is perfectly cast in his role. And Shah Rukh Khan makes a magical cameo. Conclusion: Tubelight is a good movie which is technically of the highest standard. The budget is high, the scale is huge, the production design is almost perfect. But somewhere down the line it fails to do its most important job.. that is to organically connect with the audiences. Emotions feel manufactured and situations can feel contrived. But the superstar goes above and beyond his abilities and has chosen to do a film like this. It takes great courage to innovate when you are at the top of your game. The geopolitical and social commentary portrayed is relevant even today. If you’re expecting a gangbusting action flick, then Tubelight is not the film for you. Watch it for the sweet little friendship between Bharat and Guo (Salman and the adorable Matin Tangu). Note: Due to insane amount of traffic that we are receiving currently, the comments section will be closed for the first 15 minutes. We open it at 1:35PM Indian Time. Please do come back and post your comments. We apologise for the inconvenience. Finally, it’s Tubelight day. The long wait for the film is over and watched it today. Well, without giving away plots and stories away, let me give my opinion on the film. Although Tubelight is set in the backdrop of Indo-Chinese war in 1962, it is very much relevant in today’s situation in India in particular and global situation in general. It smartly deals with some hard-hitting subjects like having FAITH in yourself can help you overcome some of most difficult situations, how the War is futile for anyone involved and how hyper-nationalism destroys peace and harmony. The subject of the film is very real but the characters are too realistically executed that it leaves hardly any spaces for some cinematic entertainment for the audiences. The Director Kabir Khan, hailing from a documentary film background, has hardly taken any cinematic liberties, call it good or bad. The film is thoroughly emotional portraying the lives of the armies and those of their families they have left behind. There are some emotional scenes which were not required but looked enforced. In my opinion, the film would have done well without those scenes. It also shown how I’ll-equipped Indian armies are and how it costs the lives of many soldiers in the border areas. The film drags in some parts. PERFORMANCE WISE, Salman has done a superb job as per the level of his performance in Tere Naam, barring for some of his emotional scenes which were not perfectly executed. Sohail did a superb job. Any criticisms towards his acting are totally unjustified. All supporting actors, Zeeshan Ayyub, the late great OM Puri, the cute little child and Zhu Zhu all have done amazing jobs. SRK Cameo was very impressive. No criticisms to any! MUSIC really works well in the movie and the cinematography is a top notch. It’s indeed a treat to watch. Overall, this is a very good film and a must watch for those people who love to watch realistic films. In this regard, you can even disregard the reviews of some critics and watch the film. You have to congratulate Salman, rather than criticizing him, for choosing a subject he has never attempted before. He has hugely underplayed his onscreen image and stardom; and handed him over to the director. This is not a typical masala film or even a film with masala elements. It looks like more of an offbeat film. Those people who get used to watching Salman doing a lot of actions and larger-than-life roles and those critics who expect him to always do such stuffs may not connect with Tubelight. Kudos to Salman for trying an unconventional subject and choosing a subject that undermines his on-screen persona. Excuse me for some grammatical errors. They are typing mistakes as I have quickly typed them on phone. Ye kya ho gaya , I thought it will be an awesome movie !!! Hope the critics don’t have an intent to sabotage it. I am yet to watch the movie though. why salman fo these types of movies because of other star fans,we want salman to come in his regular avtar.anyways its the eid and basi eid that will decide the real picture. it’s quite obvious that Salman career is coming to an end . I think TZH will turn out bigger disappointment than Tubelight. his so called giving bb every year on Eid have been shattered !!!!! if Tubelight was some other actors movie , then indicine would have given 1 star. tubelight is a complete torture. even 200 cr looks extremely difficult for tubelight to achieve !!!! not only tubelight but also TZH will disappoint trade , audience alike !!! it’s such a shame that both big festivals have been wasted by Salman khan !!! I think it will be much better for Padmavati makers to push its release date to 21 or 15 December 2017 if they want their film to work big time !!!!! So called medicore director with poor track record. Who knows even Raj Hirani can disappoint us with Dutt Biopic and Remo De Souza Can even deliver masterpiece in his next with Salman. Among Salman films of this decade. Just finished the early morning show of TUBELIGHT. Must confess being a BOLLYWOOD movie fan that this one doesn’t have its heart at the right place. SALMAN KHAN really doesn’t know how to act. Infact ZEESHAN AYYUB has overshadowed him in some scenes. LATE MR. OM PURI is typically brilliant but the movie drags and gets really boring in the second half. U really feel taking a LOO BREAK from this one. SALMAN KHAN’s acting is the worst ever in this one. The response is dull for the movie..after bajrangi bhaijan the expectation were too high..i think it will not take the advantage of eid holiday..which sultan did..